How can I keep my kidneys working as long as possible? 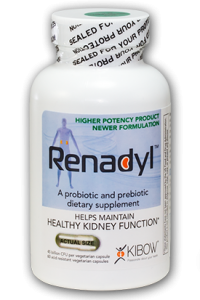 Maintaining a healthy lifestyle with diet and exercise, being diligent with treatment, and taking a probiotic like Renadyl™ can help support proper kidney function. If necessary, a transplant may be a viable option before beginning dialysis. Speak with your physician to find out what the right plan of action is for you. How good can my life be with CKD? In the early stages of CKD, the symptoms may be subtle and difficult to identify. However, later stages can cause fatigue, itching, loss of appetite, and other symptoms that can reduce your quality of life—if you take no action. Learn what to watch for and keep your doctor informed so that you can get the help you need. It is also important to follow your treatment plan. For example, taking the right doses of your medications at the right times may help slow the progression of CKD. Your quality of life with CKD depends on your attitude and whether you are able to adapt to and maintain a healthy lifestyle. Remember, the symptoms of CKD are treatable. How long can I live with CKD? Many people think that if their kidneys fail, they will die immediately. This may have been true 40 years ago when dialysis machines were extremely rare and expensive and medical knowledge about kidney disease was limited. However, today’s access to dialysis is much easier and the knowledge surrounding CKD has increased substantially. A patient’s life expectancy depends on age, other health issues, and how dedicated he/she is with his/her care. Some people with early CKD do not progress to kidney failure. Others reach kidney failure and still live for decades with dialysis or kidney transplantation. Recent advancements in kidney care have allowed for better treatments, more knowledge about how to slow kidney failure, and the development of technically advanced dialysis machines. Even with these advancements, the most important factor is still the individual who has the disease. So, ask questions, and explore with your doctor and care team the best way for you to help manage your disease. CKD is permanent kidney damage due to injury or disease. CKD ranges from mild to severe, and severity is classified as stages 1–5 depending on loss of kidney function. If CKD reaches the point of kidney failure, dialysis or a kidney transplant is needed to support life. Since CKD may worsen over time, early diagnosis and treatment can help slow down disease progression, depending on the cause of the damage. There is an amazing amount of bacterial cells associated with the human body. Most are not harmful, and many contribute to normal human growth and development. It is believed that good gut bacteria make up about 70% to 80% of the body’s total immune system. However, some can have a negative influence and cause various diseases. That is why it’s important that the balance of microbes be maintained to favor the beneficial bacteria over the potentially harmful ones. The ratio of beneficial to potentially harmful bacteria in the gut should be 80/20. Probiotics help maintain a proper balance of good bacteria and bad bacteria in the body. Can’t I get probiotics by eating yogurt? Many probiotic strains are found in yogurt. However, the pasteurization process involved in making yogurt kills all natural organisms, making the presence of probiotics unpredictable. Most manufacturers add the good bacteria back into their products after pasteurization, with varying effectiveness. Many yogurts only contain about 10 billion colony-forming units (CFU) of good bacteria. 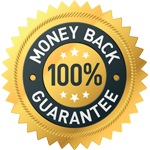 Probiotic supplements are standardized.Renadyl™ is guaranteed to contain a very high level (45 billion CFU) of the 3 bacteria that promote kidney health in each serving up until the expiration date. How do probiotics help my kidneys? Probiotics take on some of the blood-cleansing functions that impaired or damaged kidneys are unable to perform. These probiotic organisms ease the burden on ailing kidneys and help reduce some of the serious side effects of toxic waste buildup in the bloodstream. Probiotics are living microorganisms that have beneficial effects on the human body. Certain probiotics have shown to have an impact on maintaining kidney function in people with impaired or damaged kidneys. The 3 types of bacteria have been specially selected for use in Renadyl™:Streptococcus thermophilus, Lactobacillus acidophilus, and Bifidobacterium longum. Prebiotics are naturally occurring fiber materials that may be digested by probiotics to help them grow. Renadyl™ contains a prebiotic called psyllium husk (naturally occurring plant material). Synbiotics are supplements that contain both a prebiotic and a probiotic. The majority of probiotics on the market today, including Renadyl™, are considered “synbiotic.” The main reason for using a synbiotic is that a true probiotic, without its prebiotic food, does not survive well in the digestive system. Are there any side effects associated with Renadyl™? The only side effects experienced by patients in safety trials was minor bloating that disappeared in about a week while they continued taking the supplement. Are these genetically modified microbes? 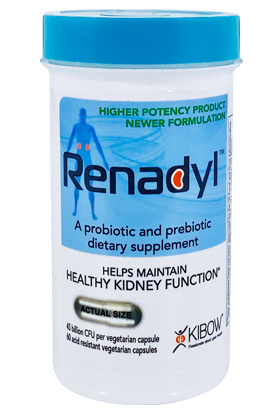 No, Renadyl™ uses naturally occurring, specially selected probiotics that have a high affinity for the toxins that build up in the blood due to impaired or damaged kidneys. Can I take antibiotics with Renadyl™? You can take probiotics during treatment with antibiotics. Probiotic supplements should be taken 4 hours after the antibiotics. Probiotic use should not interfere with the efficacy of antibiotics. Renadyl™ is not meant to replace dialysis or any other medications prescribed by a physician. Renadyl™ is not a drug, medicine, or device. It works in conjunction with other treatments to maintain healthy kidney function. Renadyl is manufactured adhering to Current Good Manufacturing Practices (cGMPs). cGMP regulations are enforced by the FDA. cGMPs provide for systems that assure proper design, monitoring, and control of manufacturing processes and facilities. Adherence to the cGMP regulations assures the identity, strength, quality, and purity of products by requiring that manufacturers adequately control manufacturing operations. Please consult your doctor/healthcare professional prior to taking this product or any other dietary supplement product on the market. The US Food and Drug Administration (FDA) regulates dietary supplements under a different set of regulations than those covering “conventional” foods and drug products (prescription and over-the-counter). Under the Dietary Supplement Health and Education Act of 1994 (DSHEA), the dietary supplement manufacturer is responsible for ensuring that a dietary supplement is safe before it is marketed. The FDA is responsible for taking action against any unsafe dietary supplement product after it reaches the market. Generally, manufacturers do not need to register their products with the FDA or get FDA approval before producing or selling dietary supplements. The probiotic strains used in our proprietary, patented formulation are considered to be safe under the Generally Recognized as Safe (GRAS) classification by the FDA. *Manufacturers must ensure that the product label information is truthful and not misleading. Recently completed results from human clinical trials have reaffirmed the safety of Renadyl™.10 Additionally, an animal formulation has been on the market for cats and dogs living with compromised kidneys since 2006. No adverse effects in these animals have been observed. What are some of the toxins metabolized by Renadyl™? The probiotics found in Renadyl™ demonstrate a strong affinity for many of the nitrogenous wastes that accumulate in the blood in the event of kidney failure. These toxins include urea, uric acid, creatinine, indoles and phenols, and nitrosamines and their precursors. Why are the microbes in Renadyl™ more effective at ingesting uremic toxins than other probiotics? Clinical studies have shown that the 3 strains of probiotics in Renadyl™ have a high affinity for urea and uremic acids. These 3 strains are specially selected and will metabolize the nitrogenous waste in the body. They are also gastric acid resistant capsule, which means that they are unaffected by stomach acids that can kill probiotics on their way through the gastrointestinal tract, thus improving efficiency.